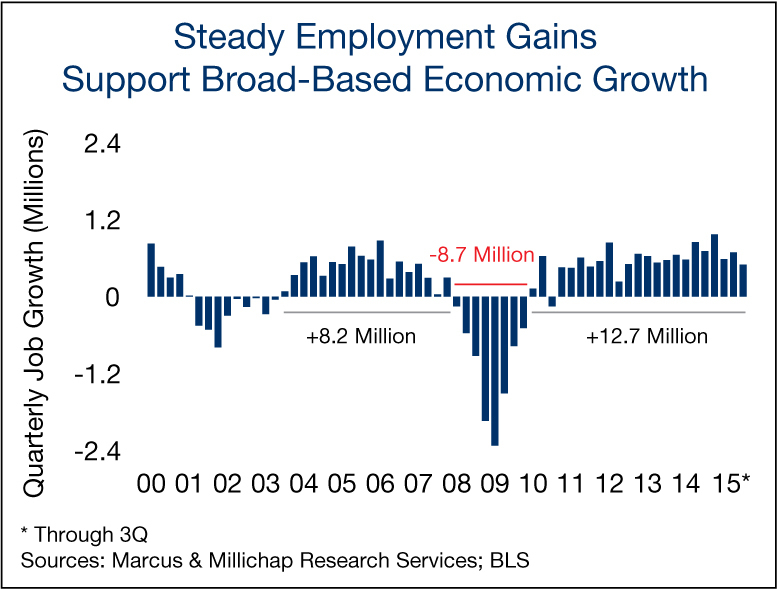 The U.S. economy continued to make headway in September, though the pace of employment growth slackened. Employers have added 1.8 million workers so far this year, a steady performance in the face of international turbulence and economic weakening that began to emerge in August. These negative headlines, together with sliding exports induced by the stronger dollar, caused some employers to slow hiring. A silver lining of the slower labor market will be increased caution by the Federal Reserve as it contemplates a rate hike. The central bank will digest the payroll numbers at its October meeting, while also considering other employment metrics, inflation, and global and domestic economic trends before reaching a decision on how to manage the Federal Funds rate. U.S. job creation fell shy of expectations in September, adding 142,000 workers as both the energy and manufacturing sectors shed jobs. Generally, results remained positive, led by 31,000 new professional and business services positions, and 31,000 new hires at bars, restaurants and hotels. The hotel industry is recording its most significant construction since the recession, and additional hiring will occur in the near term as properties come online this year and in 2016. Full-time employment has recovered to its pre-recession levels while part-time employment has also expanded. Individuals purposely selecting part-time work for lifestyle reasons remain the principal driver of growth in part-time employment. Part-time employment has risen steadily as the U.S. shifted from a manufacturing-based economy to a higher dependence on service businesses over the past 50 years. The greater availability of jobs working limited hours in fields that include call centers, hospitality and retail has lifted the percentage of employment in part-time positions to more than 18 percent as of September, near an all-time high. Rising consumption and the growth of e-commerce has spurred retailer demand for warehouse and distribution space nationwide, fueling an increase in requirements for truck drivers and workers to stock shelves and fill orders. Year to date, more than 59,000 positions were added in transportation and warehousing, including a nominal gain in September. In the first half of this year, national industrial vacancy dipped to 6.9 percent. A combination of restrained completions and growing demand will slice the rate to 6.5 percent this year and support a 5.3 percent climb in the average rent. Retailers added nearly 24,000 workers last month, reflecting early hiring for the holiday season and additional store openings. This year, the national vacancy rate will fall 30 basis points to 6.1 percent behind net absorption of nearly 75 million square feet. Retail property construction remains well below the annual levels posted before the recession, partly as a consequence of lagging new home construction, and will support additional declines in vacancy. This entry was written by marcusmillichap, posted on October 5, 2015 at 4:40 pm, filed under Uncategorized. Bookmark the permalink. Follow any comments here with the RSS feed for this post. Post a comment or leave a trackback: Trackback URL.